As much as I don't want to admit it, Fall it poking her pretty little head around the corner. Don't get me wrong, I LOVE Fall (enter Pumpkin everything) but nothing holds the place of Summer for this Cali girl. I will say though, nothing beats Fall fashion, and while perusing my fave stores to put together my Fall wish list I noticed one thing - Fall accessories are on point this year! Over the next few weeks I'll be sharing my top picks for shoes, bags and accessories, to carry all you little fashion queens into the Fall. Burgundy has, and always will, be red hot for Fall! 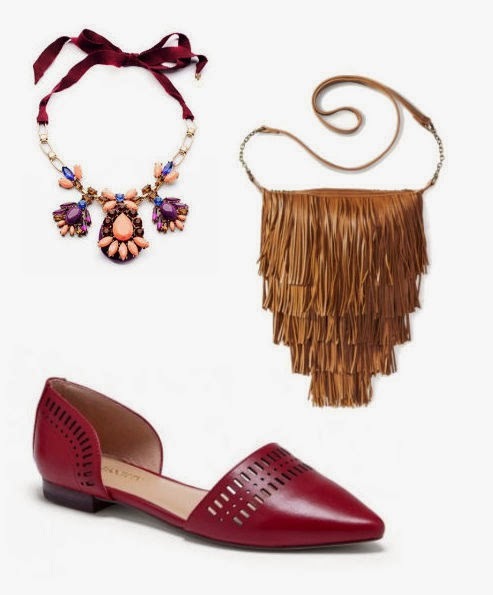 I love the idea of pairing these burgundy flats with an edgy fringe bag and feminine statement necklace. These accessories would pair nicely with jeans and a tee shirt, and since that's all I seem to wear lately, it gets my first pick. Great picks, love that necklace!